Stratocumulus clouds are a very common type of clouds which you do see around quite often. They sit lower to the ground that other cumulus clouds but look similar to them. These clouds look like rain but will rarely give it to you. One of the most general and probably the most visually appealing types of stratocumulus clouds is the stratocumulus stratiformis. What are stratocumulus stratiformis clouds? When you look at the sky and find yourself saying that the sky looks cool, more often than not, you are looking at a stratocumulus stratiformis cloud cluster. This is because these clouds create one of the most interesting effects as they transition from sheets of stratus clouds to puffy blankets. They are a single transient type of stratocumulus cloud with a significant look. What height are stratocumulus stratiformis clouds found? 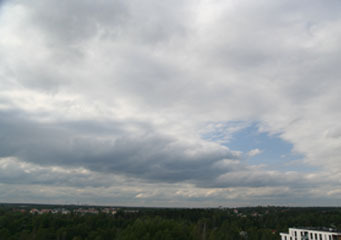 Stratus clouds are very low-lying. They are even lower than stratocumulus clouds, which sit just slightly above them. So, with a cloud that has a name that says stratocumulus and something along the line of stratus clouds again in the second part of the name, you will no doubt be looking at a low cloud that sits under the 8,000 foot mark. There are many types of stratocumulus clouds that are formed from other types of clouds. Stratocumulus stratiformis is one of these. This transient type is created specifically from stratus clouds. It is classified as an undulatus cloud because of its wavy shape rather than its puffy buildup shape. How are stratocumulus stratiformis clouds formed? Low sheets of stratus clouds love to sit in the sky during and after rain. When the rain stops, though, the sun will begin to shine and the temperature will begin to rise. This will cause the low sheets of stratus clouds to be broken up and rise up just a little. This allows some light to come through in places, and the clouds themselves to fill out a little more and become more of a blanket than a sheet. What do stratocumulus stratiformis clouds look like? Dark and heavy on the bottom, reminiscent of rain clouds. Low-lying, even more so than most stratocumulus clouds. A little puffier than stratus clouds, but with a sort of wavy shape. Still sheet like, but with holes letting light shine through. How common are stratocumulus stratiformis clouds? These clouds are actually fairly common during certain seasons. If the weather is fairly warm and the humidity that was in the air is fading due to a rising temperature, stratus clouds that were present will always break up in this manner. This makes this one of the more common types of stratocumulus cloud. Where can I see stratocumulus stratiformis clouds? The most common place you will be able to see stratocumulus stratiformis is after a light or heavy rain where the sun did not shine due to low lying rain clouds. You can actually watch these transient clouds form as the stratus clouds break up.